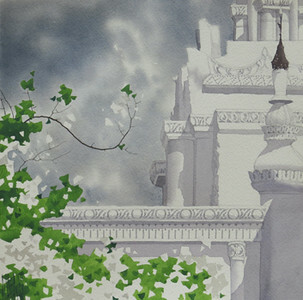 Moe Nyo’s uses his distinctive watercolour style in the Poem series shown here to capture isolated corners of traditional architectural sites which are then offset with splashes of greenery. In this manner permanence is contrasted with the transitory, and ordered, angular man-made objects are contrasted with the freedom and spontaneity of nature. Watercolour has been an important medium in Burmese art since it was first introduced by the British in the late 1800’s. Born in a small village in 1976, Moe Nyo moved to Yangon in 1994 to attend the University of Culture. From an early age, he knew that he wanted to be an artist, but knew that this was a difficult career to pursue. Moe Nyo experienced many challenges in the capital city in the first few years but when he discovered his passion for watercolors, he was determined to learn all he could about this most exacting of mediums. He attended the University of Culture from 1994 – 1997, holding his first exhibition in 1997. Moe Nyo was fortunate to have a teacher who recognized his talent for watercolor, and encouraged and supported him. He found that he was different to most of the other students who preferred oils or acrylics. After graduating in 1997, he stayed on at the University of Culture as a teacher, and he remains there today. He is the acknowledged watercolor expert, passing on his expertise and love of the medium to generations of Myanmar art students. Moe Nyo has always been interested in the structure of things: temples with their clean lines and architectural detail and also to the shape and structure of branches and plants. But above all, he enjoys using white in his paintings, and the few splashes of color are there mostly because of their contrast with white. The scenes he paints are what he remembers from his childhood in the Dry Zone, when he ran with his friends around the pagodas and stupas. The hot pink of the bougainvillea that thrives in dry climates, the dark boughs of leafless trees, the pale tones of the pagodas shimmering in the heat – these are all indelibly lodged in his artistic memory. Of his limited color palette, Moe Nyo says, “It would be painful to paint something with many colors”. He sometimes takes two to three days just to do the sketch of the scene he wants to paint. Every fine detail is recorded. Then, with his long experience and assured touch, the painting is completed quite quickly. The white in the painting is blank paper. Although transparent watercolor is the most difficult to master, Moe Nyo is deeply attached to this medium, because it gives him a great sense of peace and tranquility while he is creating these works. Above all, he wants to share that feeling with the audience, as they look at these luminous, delicately perfect works. Moe Nyo, Poem (11). Watercolour, 2014. 11 X 11 in.